A new report by the Colorado School of Mines’ Potential Gas Committee (PGC) finds the Atlantic region — which includes the Marcellus and Utica shales — has the most promising natural gas potential in the country at a whopping 1,047 trillion cubic feet, accounting for more than a third of the jaw-dropping 3,100 trillion cubic feet (Tcf) the report finds might be recoverable nationally. 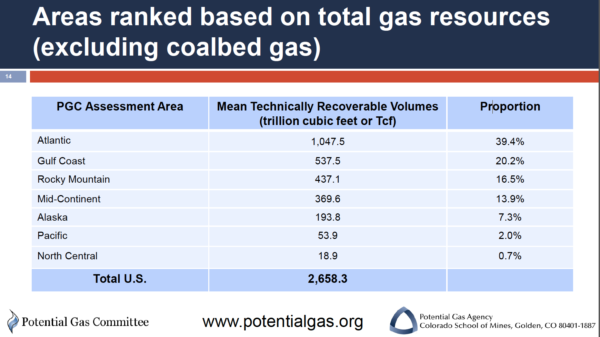 As you can clearly see below, the Atlantic PGC Assessment Area accounts for 39.4 percent of all U.S. technically recoverable natural gas found in the report. The PGC report also notes that Ohio’s Utica Shale “is now assessed to have a considerably larger sweet spot area with highly productive wells.” This news comes just two years after West Virginia University found an astounding 782 trillion cubic feet (Tcf) of technically recoverable natural gas in the Appalachian Basin – more than 20 times the 38 Tcf amount previously discovered in a 2012 United States Geological Survey (USGS) study. While this information is helpful and certainly exciting, it underscores the bottleneck the Appalachian Basin is facing — there is an abundance of natural gas, but not enough pipelines to move it to consumers. It’s clear the problem for Marcellus and Utica shales is not production, but takeaway capacity. With the Marcellus Shale producing around 19 billion cubic feet (Bcf) of natural gas per day and the Utica Shale producing 4 Bcf per day, according to the U.S. Energy Information Administration (EIA), it should come as no surprise that Ohio alone is looking at five major gas pipeline projects, which would transport 6.75 Bcf per day. The Buckeye State has also seen $10 billion worth of investment in natural gas fueled power plants driven by a potentially huge local natural gas supply. However, only one of the five pipeline projects and one of the 12 natural gas power plant is in operation, which means that there’s a lot of infrastructure and consumer end use still on the table. Many of these natural gas lines, such as the NEXUS pipeline, will prove critical to power 12 new natural gas power plants which will power over nine million homes with clean burning electricity. In addition, pipeline projects such as Shell’s Falcon Ethane Pipeline will traverse through the Utica and Marcellus shales, carrying ethane to Shell’s cracker plant in Manaca, Pa., to be converted into ethylene, the feedstock for plastics manufacturing. Ohio is also hopeful to have a final investment decision for an ethane cracker later this year. Pipelines and related infrastructure are critical to meet the growing demand for natural gas heat and electricity across the Northeast. And as this latest report demonstrates, they are also an important factor in growing production of oil and natural gas. Ohio and Pennsylvania have an opportunity to be a tremendous supplier of natural gas, not only within their own borders, but to millions of people across the country. As pipeline capacity increases, distribution of gas developed in the Marcellus and Utica will result in more affordable, reliable energy, as well as lower emissions in areas where natural gas is utilized for heating and electricity generation, considering the EIA has stated use of natural gas for electricity generation has been a major factor in the U.S. reducing carbon emissions to their lowest levels since 1991. Despite the ridicule he received on social media, U.S. Secretary of Energy Rick Perry was actually right when he recently said of natural gas, “You put the supply out there and demand will follow.” Getting the aforementioned infrastructure projects to the finish line is critical to ensuring the enormous supply of Marcellus and Utica shale gas gets “out there” and ensuring the Appalachian Basin reaches the enormous potential detailed in this PGC report.